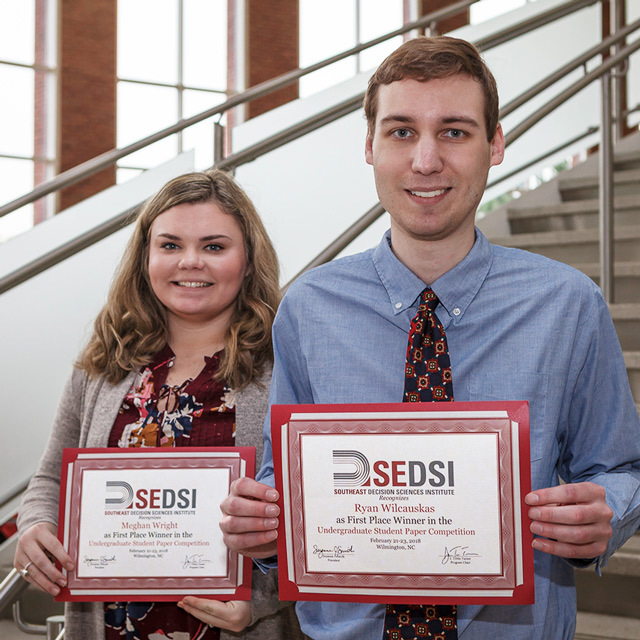 IT students Meghan Wright and Ryan Wilcauskas holding 1st place awards for their paper at the SEDSI conference. Ryan Wilcauskas, Meghan Wright and Kaitlin Reid won the Best Undergraduate Student Paper Award at the 48th Annual Meeting of the Southeast Decision Sciences Institute in Wilmington, NC. The title of their paper was The Impact of Workplace Practices on Patients Seeking Mental Health Treatment: A Decision Tree Approach. Part of the paper came from the work they did in a data mining course taught by Dr. Cheryl Aasheim that they took as part of their degree program, Bachelor of Science in Information Technology, in Fall 2017. They continued their work under the mentorship of Dr. Aasheim, running additional models and refining the paper after class ended through the winter break. Ryan and Meghan attended the conference on February 21-23, 2018. Kaitlin graduated this past Fall and, therefore, could not attend. The students received certificates and a monetary award. The students received funding to attend the conference through an undergraduate research grant they won in the Allen E. Paulson College of Engineering and Computing competition. A team of undergraduate and graduate students from the Engine Combustion laboratory, led by faculty advisor Dr. Val Soloiu, presented their research papers at the Society of Automotive Engineers World Congress in Detroit MI (4-6 April 2017). The team, composed of Martin Muinos, Aliyah Knowles, Remi Gaubert, Jose Moncada, Bernard Ibru and Thomas Beyerl, presented state-of-the-art research on topics including advanced combustion modes, noise and vibrations studies in automotive engines, and intelligent/autonomous vehicles technologies. The team received seven awards for their research. One hundred and ten CEIT students presented over 90 posters and demonstrations to dozens of industry representatives, alumni, board members, faculty and fellow students on Thursday, April 20. The IT Building Atrium was buzzing with activity all morning as students discussed their research with interested visitors. At 11:30am, Dean Mohammad Davoud spoke about the importance of research not only to students, but also to economic development in the region. Mr. Steve Justice, Executive Director of the Georgia Centers of Innovation, expanded on this theme. The six Centers of Innovation provide Georgia industries with resources for technical industry expertise, collaborative research and partnerships to help the State’s strategic industries connect, compete and grow globally. 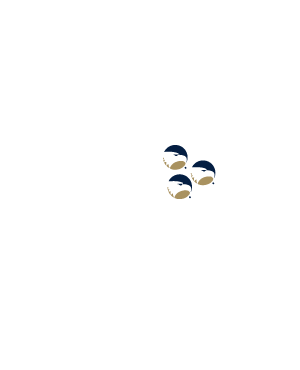 These strategic industries include aerospace, agribusiness, energy technology, IT, logistics and manufacturing. Three graduate student (teams) and three undergraduate student (teams) were presented with monetary awards supported by the CEIT Dean’s Office and the Centers of Innovation. Third place winners received checks for $175, second place, $275, and first place, $400. All the attendees were impressed by the high level of research and presentations throughout the Symposium. Second place: Md Mehedi Hasan, working with Dr. Adel El Shahat (EE) on “Performance Investigation of SSHAWT Blade by BEM and CFD.” Area: Alternative Energy. First place: Sharaf Sumaya, working with Dr. El Shahat (EE) and Dr. Kamran Kardel (MfgE) on “Cost Effective Eco-friendly Large Area Production of Organic Photovoltaic Cell by Inkjet Printing.” Area: Alternative Energy. Third place: Mariah Peart (CECM); Dylan Mesta, Sandra Yankine and Brandon Yingling, working with Dr. Gustavo Maldonado and Dr. Marcel Maghiar on “Analysis of Accuracies in 3D Point-Cloud Model of Complex City Intersection.” Area: Infrastructure. Second place: Deon Lucien (EE), working with Dr. Sungkyun Lim on “Improved Pasive UHF RFID Tag Antenna for Road Marker Navigation.” Area: Antennas. First place: Priscilla Perez (EE), working with Dr. El Shahat on “ANN-Predictive Model for Si-based Bipolar Transistor Characterization.” Area: Networks.